The result was Jazz Jamaica. Over the next eight years, Gary successfully developed the Jazz Jamaica concept by introducing a stream of talented young jazz musicians, so increasing the size of the pool of “Jazz Jamaicans”, and enabling him to extend the boundaries of the music played. After extensive international touring, and the recording of four great albums with Jazz Jamaica, Gary was ready to move to the next stage and in March 1999 he expanded the core lineup of Jazz Jamaica to formal big band status by adding a raft of guest soloists. The result was Jazz Jamaica All Stars. The music has its genesis in the London jazz scene of the 1940s and 1950s which embraced the music of the first generation of Caribbean immigrants, and there is a creative line that runs through free jazz pioneer Joe Harriott in the 1950s, via guitarist Ernest Ranglin’s work in the 1960s, through the Jazz Warriors and saxophonist Courtney Pine in the 1980s, to Tomorrow’s Warriors in the 1990s right through to their current cohort. Jazz Jamaica All Stars is the first formally structured big band to play this particular blend of jazz. They reflect the Caribbean music tradition and demonstrate in vibrant and exuberant form its massive contribution to a living, constantly changing jazz tradition. And what’s great is that you don’t need to know a lot about jazz to enjoy an evening with this all-star band. ­Anyone with a love of ska, big brass sections, Latin sounds, or classics like Millie’s My Boy Lollipop, Prince Buster’s Al Capone, Wayne Shorter’s Footprints and Herbie Hancock’s Dolphin Dance will love the Jazz Jamaica All Stars. In fact, whilst dancing isn’t ­guaranteed, the music is so infectious, we have yet to see an audience fail to get to its feet! Jazz Jamaica All Stars released their début album, Massive (Dune Records DUNECD06) in October 2001 to immense critical acclaim and earned a place in the Top Ten Albums Of The Year in top critics’ ratings (The Guardian/The Times). In July 2002, Gary was presented with the BBC Radio Jazz Award for Best Band for Jazz Jamaica All Stars. Also in July 2002, he received an award from Jamaican music legends and Ocho Rios Jazz Festival directors, Sonny Bradshaw OD and Myrna Hague for Consistent Contribution to Music In Jamaica, earning him a place in the Jamaica Jazz Hall of Fame. After more successful touring in 2003, 2004 saw Jazz Jamaica All Stars collaborating with one of the iconic ­figures in South African culture, Hugh Masekela in an exciting project to mark the 10th anniversary of ­democracy in South Africa. The music, specially arranged by saxophonist Jason Yarde, featured some of Masekela’s most evocative pieces as well as other seminal songs of freedom such as those by Bob Marley. A whirlwind of Caribbean and South African grooves! 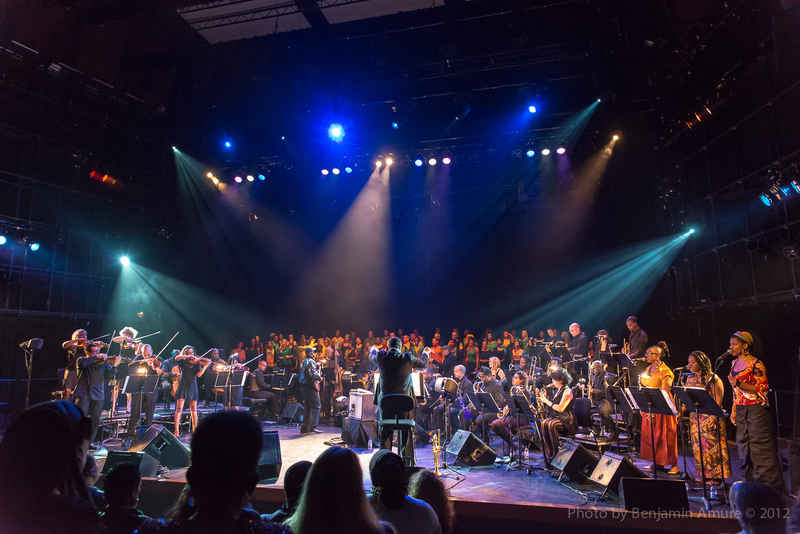 Vocal duties were shared by Juliet Roberts and Masekela, as well as massed choirs from East London schools – the culmination of an extensive education project commissioned by the City of London Festival and run by members of Jazz Jamaica All Stars and Masekela. Jazz Jamaica All Stars and Hugh Masekela toured the UK and made a special appearance at the North Sea Jazz Festival, The Hague in June/July 2004. Gary returned to touring a small(er) Jazz Jamaica in 2005, paying tribute to the stars of Motown with their fabulous album, Motorcity Roots (Dune Records DUNECD012), and touring extensively with an all-star 12-piece line-up. In 2007, Jazz Jamaica headlined the Dune Music 10th Anniversary concert at a sold-out Royal Festival Hall, London featuring Gary’s uncle, the great Jamaican guitarist Ernest Ranglin, eminent Jamaican pianist and ethnomusicologist Marjorie Whylie, and Jamaica’s first lady of Jazz and Studio 1 vocal pioneer, Myrna Hague. Since then, the band has toured a variety of sets including Motorcity Roots, Tighten Up! (a tribute to Trojan Records), and The Blue Note Blue Beat. In late 2012, Gary reassembled his all star big band, Jazz Jamaica All Stars to headline the Lively Up! Festival marking 50 Years of Jamaican independence. In fact, more than reassembling the band, he supersized it with the addition of a strings section from Urban Soul Orchestra and reggae star, Brinsley Forde. Jazz Jamaica All Stars saluted the global and iconic superstars, Bob Marley and The Wailers in a massive musical extravaganza paying tribute to their seminal album, Catch A Fire on a fantastic tour of eight UK cities that saw the band working also with a range of community gospel choirs.